Gastroesophageal reflux disease (GERD) is a gastric disorder which causes stomach acids to back up into the esophagus, the tube leading from the mouth to the stomach. This action causes pain , which is often called heartburn. GERD can disrupt sleep and make eating difficult. It can lead to respiratory infections, ulcers, and even cancer . The reflux action of gastroesophageal reflux disease is a function of the weakening of the lower esophageal sphincter (LES). The LES is a muscle located at the bottom of the esophagus and acts as a doorkeeper to the stomach. When food is eaten, it passes through the esophagus and the LES and into the stomach. 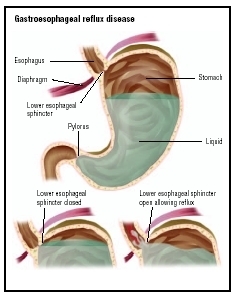 The LES closes after food enters the stomach and usually keeps the stomach contents from returning up the esophagus. In an infant, the LES may not be well formed, which causes the baby to spit up or vomit. In an older child or adolescent, the LES weakens and acids from the stomach come into the esophagus, causing the characteristic burning in the middle of the chest, known as heartburn. Everyone has experienced this reflux occasionally, and it is not a concern. It is when the reflux occurs often that the condition should be evaluated. Infants and children who do not vomit or complain of heart-burn or stomachache may have this condition. When the stomach contents moves into the esophagus, there is the possibility that this material will be aspirated into the windpipe, which can cause asthma , pneumonia , and possibly suffocation or sudden death. GERD was thought to be implicated in sudden infant death syndrome (SIDS); however, subsequent studies concluded it was not. Some children and adults have few episodes of heart-burn over their lifetimes, but they have frequent bouts of ear infection, sinusitis , bronchitis , and even asthma. Some children and adults only experience a vague indigestion. They come to the doctor because they are having trouble eating. They feel that there is something in their throats or that their food keeps getting stuck when they eat. This may be a serious condition called dysphagia, which develops from long-term GERD. The stricture of the esophagus is caused by a thickening of the lining of the esophagus in response to acids from the stomach. Sometimes, when swallowing hurts, the condition is called odynophagia. This type of GERD is often referred to as silent reflux. Constant irritation by stomach acids in the esophagus can cause a condition called esophagitis, in which the esophagus becomes red and irritated. Because the lining of the esophagus is thinner and not as acid-proof as the stomach or the intestines, undiagnosed GERD over many years can cause ulcers along the esophagus. These can bleed and can, in turn, result in anemia. Scar tissue can also build up. Sometimes, the body tries to protect the esophagus by growing a thicker lining, made up of cells like those in the stomach and intestine. This is known as Barrett's esophagus and is a pre-cancerous condition that usually leads to cancer of the esophagus. One-third of the adult population (95 million) have GERD symptoms once a month, while 15 million have symptoms every day. Though half of people who have GERD are between the ages of 45 and 64, infants, children, and teenagers also have GERD. GERD affects 50 percent of all healthy, full-term newborns. It is the primary reason for most vomiting in infants during the first four months, at which time the vomiting should stop. Less than 5 percent of infants with GERD continue the problem into adulthood. However, this figure may be revised upward as more and more young children experience GERD symptoms and are diagnosed with this condition. Some children seem to be more at risk for having GERD than others, particularly children who have hiatal hernia , cystic fibrosis , neurological impairment or delay, or an immature esophagus and LES. GERD is caused by a weakened or immature LES. It can also be caused by a hiatal hernia that traps the stomach contents. Having too much acid in the stomach can also weaken the LES. Heredity plays a small part in whether a child has GERD. GERD seems to be more prone to occur in some families than others. Other factors that seem to weaken the LES are allergies and neurological disorders that affect specific muscles in the body. Diabetes and rapid weight gain can also be factors in causing GERD. Some medications also can weaken the LES. They include calcium channel blockers used to treat high blood pressure, theophyline used to treat asthma, and antihistamines . Nitrates in medications and foods can also trigger GERD. In infants, it may simply be a matter of having an immature digestive system. Once the body begins to mature, the GERD goes away. For adolescents, the hormones of puberty seem to trigger acid reflux. Certain foods have been known to affect the muscle tone of the LES and increase stomach acids. Chocolate, peppermint, and high fat foods can allow the LES to relax and stay open more often. Citrus foods, tomatoes, and tomato products increase acid production in the stomach. Lifestyle habits can also trigger episodes of acid reflux. Using caffeine and alcohol, smoking , eating large meals, and having poor posture can produce GERD. Though heartburn is the characteristic symptom of GERD in adolescents and adults, GERD in children and infants is not so easy to recognize. Frequent vomiting or spitting up is the usual indicator for GERD in children. However, vomiting can be a symptom of many other childhood disorders, including stomach flu, allergy, or a related symptom to almost any illness. Frequent vomiting that continues after the first four months of life or is excessive at any time usually indicates the presence of GERD. Constant crying with back arching usually accompanies the frequent vomiting. Children with GERD who are preschool age and older often have gas and abdominal pain above the navel. They only have intermittent vomiting. They can also experience chest pain or true heartburn symptoms, which can last up to two hours and get worse after eating. Bending over or lying down makes the heartburn worse. Children with GERD exhibit difference symptoms. They can either gain or lose weight. One group of children will eat more because they are uncomfortable and a full stomach seems to make them feel better temporarily. Another group of children are often very picky about what they eat, refusing specific foods. These children will only eat a few bites even though they might be very hungry. A third group of children report having trouble swallowing; they choke or gag whenever they eat, no matter what foods are served. A fourth group of children will drink liquids constantly because doing so soothes the burning feeling in their esophagus. Respiratory symptoms are twice as likely to occur in children with GERD as those who do not have it. Children often have frequent sore throats when they wake up in the morning, sinus infections, bronchitis, and dry coughs. These children have a constantly runny nose or a hoarse, deep voice. They can also experience wheezing or other asthma symptoms. Some children aspirate the stomach contents, which can cause pneumonia or even sudden death. Sleep is often disturbed. Children often wake up with a nighttime cough or choke when they lie down. Some children experience sleep apnea (interrupted breathing). Other children have frequent ear infections or drool a lot. Some infants and toddlers will insist on being held upright and not laid down, often falling asleep over a parent's shoulder or in a parent's arms. In some extreme cases, when there is a lot of stomach acid regurgitation, the child's teeth will show enamel erosion. Children with GERD may also have hiccups or belch a lot. They can also have bad breath and complain of having a sour taste in their mouths. Some children with GERD have anemia. This condition usually develops because there is an ulcer in the lining of the esophagus that has begun to bleed. It is important to call the doctor if GERD symptoms occur frequently or get worse. If symptoms disturb the child's sleep and interfere with school and play , a doctor should be consulted to determine a course of treatment. Also, if a child is not eating or gaining weight or has breathing difficulty, parents should seek medical advice as soon as possible. For a child of any age, if blood is present in vomit, a doctor should be called. If a child over two complains of swallowing difficulty, a serious condition could exist and a doctor should be called. In some cases, the doctor will diagnose GERD after taking a thorough medical history, listening carefully for GERD symptoms, and doing a physical exam. Many doctors will also order a series of tests to gauge the extent of damage done by GERD. Sometimes, chest x rays are ordered to check for pneumonia or lung damage due to aspiration of stomach contents. The most common tests, however, are the upper GI (gastrointestinal) series and the upper GI endoscopy. The upper GI series looks at the esophagus, the stomach, and the duodenum, or the first section of the small intestine. The child is asks to drink a cup of liquid that coats the digestive track. Because this liquid has usually been barium, a metallic, chalky substance, the upper GI series is sometimes called a barium swallow. X rays or images are then taken as the barium flows down the esophagus, into the stomach, and into the duodenum. The child may be asked to turn on his or her side so that the technician can gently massage the stomach to move the barium into the duodenum. Images are often sent to a video monitor where the doctors and technicians observe the behavior of the upper digestive tract and snap still images from the monitor. The upper GI series is particularly important in diagnosing infants. It can tell if there are anatomical changes in the esophagus, such as a hiatal hernia, a condition where the stomach bulges above the diaphragm. It can also assess damage to the esophagus and can determine if there are stomach ulcers or ulcers in the duodenum. The upper GI endoscopy, also called the esophagogastroduodenoscopy (EGD), by contrast, is a more sensitive test and offers a more complete picture of what is happening in the upper digestive tract. As of 2004, it was the test of choice for many gastroenterologists (doctors specializing in diseases of the digestive system). For the endoscopy, the patient receives a mild sedative, then a small, flexible tube is inserted into the esophagus. The tube has a light and a tiny camera attached to its end. There also is a small instrument to take tissue samples if the doctor needs to do so. The camera broadcasts live images from the esophagus and stomach to a video monitor. Using these tools, the doctor can capture still images for further diagnosis and hospital records, and the doctor can examine suspicious areas more closely with the camera or by taking tissue samples. The EGD allows the doctor to determine the extent of damage to the esophagus and to rule out serious complications like Barrett's esophagus. Mild GERD may show no damage to the esophagus at all. The GED is a good tool for determining esophagitis. Another test the doctor may order is esophageal manometry. It measures how well the LES and motor function of the esophagus are. A thin tube is inserted through the nose and down the throat. Coupled with the 24-hour pH probe study, the test becomes the best determinant of GERD because it actually monitors how often the patient has reflux into the esophagus during a full day. One episode of acid reflux is considered having a pH of less than 4 for at least 15 to 30 seconds. This test can see if there is a correlation between episodes of acid reflux and other symptoms, such as chronic cough, wheezing, or sleep apnea. The doctor may also order a gastric emptying study. For this test, the child is asked to drink milk mixed with a radioactive chemical. Then, the child is monitored, using a special camera. Episodes of reflux can be seen with this test. There are two main treatment methods for GERD. The first is lifestyle change. This usually means that patients should not eat within three hours of going to bed. This lets the stomach empty and the acid decrease. Lying down will cause the stomach contents to come back up. Elevating the bed about six inches will also keep the acid within the stomach. Eating smaller meals more frequently will control the amount of acid in the stomach. Patients should also avoid fatty foods, caffeine, mints and mint-flavoring, spicy foods, citrus fruits, and anything with tomatoes. Carbonated beverages can also irritate the already sensitive lining of the esophagus. Alcohol and smoking should be avoided. Improved posture, with no slumping, will reduce pressure on the stomach, as will losing excess weight. For an infant, lifestyle changes are simple. Holding a baby upright for about a half hour after breastfeeding or bottle feeding will help keep reflux to a minimum. Feeding a baby on formula smaller portions more frequently can also help manage spitting up. Some doctors recommend thickening the baby's formula with rice cereal or using pre-thickened formulas such as Enfamil. This will decrease the amount of spit up or vomit, but it does nothing for reflux. It does fill up the child on a smaller amount of food and can also make the baby sleep and thus stop crying. Placing a baby in a semi-prone position as in an infant car seat only makes GERD worse. Babies with GERD should sleep on their backs in a crib or bed that has the head of the bed elevated to a 30 degree angle. Medication is the second main way to treat GERD. The doctor may first recommend non-prescription medications, such as antacids and histamine-2 receptor blockers (H2 blockers). Antacids, such as Gaviscon, Maalox, Mylanta, and Tums, help neutralize acid already in the stomach or esophagus. Some have a foaming agent, which also helps prevent acid from backing up into the esophagus. Antacids can be used every day for three weeks. If taken longer, they can produce diarrhea , interfere with calcium absorption in the body, and build up magnesium, which can damage the kidneys. The doctor will determine if they can be taken longer. Infants are only given antacids in limited doses because of the risk of aluminum toxicity. Common H2 blockers are nizatidine (Axid), ranitidine (Zantac), famotidine (Pepcid), and cimetidine (Tagamet). These should be taken one hour before meals. They block acid formation but have no effect on acid already present in the stomach. If these remedies do not work or the patient's GERD is very serious, the doctor will usually move onto the more powerful proton-pump inhibitors (PPIs). These include omeprazole (Prilosec), esomeprazole (Nexium), lansoprazole (Prevacid), rabeprazole (Aciphex), and pantoprazole (Protonix). These medications block the production of an enzyme that aids in the production of acid. PPIs stop acid production better than H2 blockers. In addition to PPIs, the doctor may prescribe coating agents, such as sucralfate (Carafe), to cover the sores and mucous membranes of the esophagus and stomach. This acts as a protective barrier to stomach acids. Some doctors also use promotility agents to tighten the LES and promote faster emptying of the stomach. These include metoclopramide (Reglan) and bethanechol (Duvoid). However, many doctors are reluctant to use these drugs because they have serious side effects. For example, cisapride (Propulsid) was pulled from the market because of safety concerns about lethal drug interactions. One last option that doctors have to treat GERD is surgery. Because lifestyle changes and medications work for most children and adolescents with GERD, the election of surgery is only used for a small number of people for whom all the other options did not work. Fundoplication is a surgical procedure that puts pressure on the LES to keep acid from backing up. During the surgery, the doctor wraps a part of the stomach around the esophagus and sews it down. This produces a one-way valve. This procedure can be done laparoscopically, a less invasive surgery where the doctor makes small cuts into the abdomen to insert a camera and the surgical instruments. This surgery produces very little scarring and has a faster recovery rate. Fundoplication is not always successful and can have complications. The surgery also comes undone in about 20 percent to 30 percent of cases. Many babies outgrow infantile GERD, but some keep having symptoms well into adulthood. In most cases, GERD is easily managed. For 60 percent of children and adolescents with mild to moderate GERD, lifestyle changes and H2 blockers are very effective. For those with severe symptoms, including esophagitis, PPI therapy works well. For relapses, long-term therapy or surgery may be necessary. GERD can be prevented by maintaining a healthy body weight, avoiding alcohol and smoking, eating smaller meals, limiting fatty foods, and eliminating trigger foods. GERD diagnosis is a recent phenomenon. Though it may have existed in the distant past, only since the 1990s have doctors begun to recognize GERD as an individual disease. Diagnosing GERD in children is sometimes controversial. Some doctors have recognized GERD as a temporary condition in infants but do not recognize GERD in children or in adolescents. Many doctors are, as of 2004, beginning to understand that GERD, like many other digestive disorders, can occur at any age. The North American Society for Pediatric Gastroenterology and Nutrition drafted guidelines for treating children and adolescents with GERD in 2001. Being educated about the disease can help parents discuss their child's GERD symptoms and treatment options with their child's doctor. Parents should help children understand that they need to take their medications regularly and that they need to make lifestyle changes. It can be hard to explain to a child that chocolate and candy canes are off limits, but like food allergies , children will learn to modify their food choices because of their special sensitivities. Normally, the lower esophageal sphincter keeps the stomach contents contained with the stomach (top). However, with gastroesophageal reflux disease, the sphincter opens, allowing the acidic contents to flow up the esophagus. be difficult for children to communicate their condition to their friends or their teachers who might not always understand that on one day they are fine and on the next they are not. Parental support will help children and teenagers cope with GERD. Cheskin, Lawrence J., and Brian E. Lacy. Healing Heartburn. Baltimore, MD: Johns Hopkins University Press, 2002. Shimberg, Elaine Fantie. Coping with Chronic Heartburn: What You Need to Know about Acid Reflux and GERD. New York: St. Martin's Press, 2001. Sklar, Jill, and Annabel Cohen. Eating for Acid Reflux: A Handbook and Cookbook for Those with Heartburn. New York: Marlowe & Company, 2003. Arguin, Amy Lynn, and Martha K. Swartz. "Gastroesophageal Reflux in Infants: A Primary Care Perspective." Pediatric Nursing 30, i. 1 (January-February 2004): 45–53. "GERD and Respiratory Infections." Pediatrics for Parents 20, i. 2 (February 2002): 4. American College of Gastroenterology. 4900 B South 31 St. Arlington, VA 22206. Web site: http://www.acg.gi.org. "Gastroesophageal Reflux Disease." Cincinnati Children's Hospital. Available online at http://www.cincinnatichildrens.org/health/info/abdomen/diagnose/gerd.htm (accessed October 21, 2004). "GERD Treatment Options in Infants and Children." WebGERD. Available online at http://www.webgerd.com/GerdTreatmentInInfants.htm (accessed October 21, 2004). Esophagogastroduodenoscopy (EGD) —An imaging test that involves visually examining the lining of the esophagus, stomach, and upper duodenum with a flexible fiberoptic endoscope. Fundoplication —A surgical procedure that increases pressure on the lower esophageal sphincter by stretching and wrapping the upper part of the stomach around the sphincter. H2RAs —Medications used to treat some GERD symptoms, for example, Tagamet, Pepcid, Axid. Heartburn —A burning sensation in the chest that can extend to the neck, throat, and face. It is the primary symptom of gastroesophageal reflux (the movement of stomach acid into the esophagus). Hiatal hernia —A condition in which part of the stomach protrudes through the diaphragm into the chest cavity. Laparoscopic surgery —Minimally invasive surgery in which a camera and surgical instruments are inserted through a small incision. Lower esophageal sphincter (LES) —A muscle located at the base of the esophagus which keeps the stomach contents from coming back into the esophagus. Proton pump —A structure in the body that produces and pumps acid into the stomach. Silent reflux —An acid reflux problem that does not cause vomiting but can cause chronic, recurrent respiratory symptoms much like asthma. Regurgitation —The flow of material back up the esophagus and into the throat or lungs. Also refers to the backward flow of blood through a partly closed heart valve.